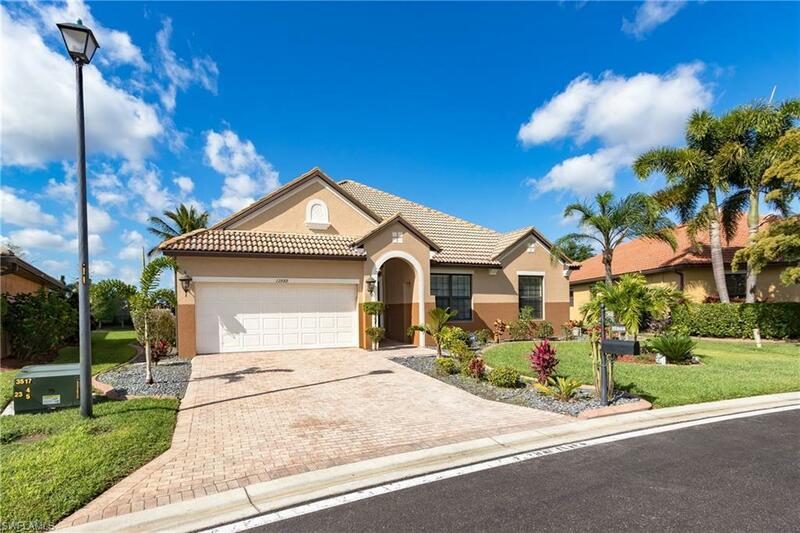 Magnificent two story lakefront family home in the harborage. Large six bedroom, four bath, three car garage w/ boat dock. Spacious open great room concept with adjacent kitchen, breakfast nook, formal dining and family room perfect for entertaining! Soaring 23' ceiling in foyer, 12 foot ceilings downstairs & 10 foot ceiling upstairs. Huge master suite with sitting area, large his/hers vanities & walk-in closets, his/hers shower and jacuzzi whirlpool bath tub. Private guest suite w/ private bath. Four additional guest bedrooms with two additional guest bathrooms. Sliding glass doors & windows throughout for incredible breathtaking lake views. This is the perfect home for large families & visiting guests to enjoy activities. Enjoy this beautiful one of a kind community featuring: tennis/pickle ball courts, playground, storage area for boats, direct gulf access, private boat ramp, two fresh water ski lakes, swimming pool, gazebo, basketball court, biking/walking/jogging trail, community beach & 24 hour security. Boat, water ski, jet ski, tube, kayak, swim & fish right from your own back yard. Dont miss this rare opportunity to own a little slice of paradise. Huge price reduction! The largest home in the most desirable community gateway has to offer has just become available! This custom one-of-kind seven bedroom and five bathroom home is an entertainers dream! This stunning home on an oversized corner lot features a summer kitchen overlooking the custom pool with waterfall backed by a scenic golf course view. This sprawling home continues to marvel as you stroll across travertine flooring and through meticulous architecture to discover extra rooms including game rooms, exercise room, two laundry rooms, and more storage than dreamed possible in a home with no basement. This home has been meticulously cared for and maintained to the highest of standards. Almost all major appliances including ac, pool system, water heaters, oven, microwave, wine fridge and dishwasher have been replaced within the last three years. If you have a large family or are looking for the best gateway has to offer, schedule your appointment today to see this show stopper! This million dollar home is priced to sell and won't be available for long! Owners have purchased a new home and are ready to move! Beautiful home has space for everybody to spread out (plus room for visitors or extended family). Spacious, elegant, and well maintained. 2 story home: rarely seen master suite on first floor (includes updated ensuite master bathroom with huge walk in closet and separate linen storage), along with living room, family room, breakfast nook, formal dining room, three guest/kids bedrooms, an additional bathroom, and laundry room. Upstairs features 2 guest/kids rooms, full bathroom, 2 walk-in closets, and office. Designer painted and featuring specialty features like arches and chair rail (just added, along with new landscaping, master bath upgrades, paint, tile backsplash in kitchen, and recent upstairs construction from loft into two separate bedroom spaces). Outdoors is a serene oasis. Youve never seen a lake view like this! Expansive lanai and half bath outside makes it ideal for entertaining or simply enjoying the peace and quiet at the end of the day. Daniels preserve, a gated community, has low fees is located near i-75, rsw airport, and shopping/dining. Homes like this dont come around often, get in to see it today!